Swirl Mastercard is the ultimate prepaid payment card. It can be used to make purchases in-store, online, over the phone, and to withdraw cash from ATMs worldwide, just like a regular Mastercard. However, unlike a credit card there are no interest charges or late payment fees, and no debt. You only spend what you load. Swirl Mastercard is ideal for controlling your spending and can also be used to share money with friends and relatives abroad*. It can even be used as a travel card. With Swirl you can load money regularly onto your Mastercard. This money can then be used to purchase goods or services at over 30 million locations worldwide or to withdraw cash at more than 1 million ATMs displaying the Mastercard logo. With Swirl you have all the benefits of a credit card but without the fear of over spending. There are no long forms to fill out, no credit checks and acceptance is guaranteed**. Buy one now to start availing of all the benefits of the Swirl Mastercard. Welcome to the future. Welcome to Swirl. ***We can only accept your Driver's Licence if it is issued in Ireland, the UK or Sweden. 2. Where can I get a Swirl Mastercard ? For instant use you can purchase a card from selected Payzone agents in your local area. Choose from over 1000 locations across Ireland and buy today for only €5.95. You can also purchase a card by clicking on the "Get a Card" button on our homepage. The card pack will be delivered to your address by post. To obtain your prepaid Mastercard® from one of our agents, simply ask the agent for a Swirl Mastercard®. No registration, ID or any other are required on purchase. You can top up once from €10 - €250 and the funds will be loaded onto your card instantly. To spend your funds you must register your card at www.swirlcard.com. Once your card has been registered successfully your funds will be available to spend online, in-store and over the phone. Your card needs to be fully verified before it can be used for cash withdrawals. To find your nearest card stockist please click here. 1. How can I top up my Swirl Mastercard? The Swirl card pack contains one card: A MasterCard. This card can be used to top up your account. You can use your MasterCard to make a single load between €10 and €500 in value. This load can be performed as soon as you purchase the card and it does not require you to register first. However, you must register your card online to spend your funds. Once this has been done your funds can be spent online, in-store or over the phone. Once your account has been successfully registered, you can top up to €2,500 in any 12 month rolling period. You will also be able to withdraw up to €1,000 cash from ATMs worldwide. You can increase the top up limit on your Swirl Card to €25,000 by logging into your online account and uploading a picture of your Passport or Driving License. Go to any of our 2,500 agents nationwide and request a top-up. The agent will swipe the card and calculate the amount due. Pay the agent. Please note you can only pay for top ups with cash. The money is instantly available for spending. Pre registration you can load between €10 and €500 instantly. Your Mastercard can only be used to top up your card once at this stage. Once you account has been registered and verified the maximum top up per transaction is €500. Please note you can do multiple top ups in a day, e.g. if you want to load €1,000 in a day you will have to do two top ups of €500 each. Customers should ensure they receive a receipt from the agent. This is the customer’s proof that the money has been topped up successfully. The funds will be available for use immediately. 2. Can I top up my card online? Your Swirl MasterCard can be topped up online by Debit Card or by transferring money directly from your bank account to your card. Please visit the below sections "Top Up Via Bank Transfer" and "Top Up Via Debit Card" for more information. Please note: Bank transfers will only be accepted from an account in the cardholder's name. Swirl Card do not accept responsibility for any bank that refuses to allow you to transfer funds onto your Swirl card through our partner bank, Catella Bank S.A..
*Individual banks charges may apply- please check with your bank prior to making the transfer. 3. Do I need to register and how do I register my Swirl Card? Prior to registration you can load once up to €250 instantly. To spend these funds you must register your card online at www.swirlcard.com. Your funds will then be available to spend online, in-store and over the phone. Registering your card does make additional features of the MasterCard available. Once you are registered and verified you will be able to load up to €2,500 per rolling 12 month period (with the option of upgrading to €7,500). You will also be able to withdraw up to €1,000 cash from ATMs worldwide. You will have access to an online account where you can check your balance and transactions 24/7. You will also be able to top up your card from your bank account, free of charge. To register your card now please click here. * A form of ID (Driver’s Licence* number or Passport number). *We can only accept your Driver's Licence if it is issued in Ireland, the UK or Sweden. 1) Log into your online account and enter the code where prompted. *Please note, customers who order their card online don't need to wait for a verification code as the account will be fully activated once registration has been completed. Alternatively, you can register by calling our helpdesk +353 01 6877 985 where one of our helpful Customer Service Representatives will complete the online registration form on your behalf. Please note that while online registration is free, you will incur a fee of €3.95 to register using our Customer Service Helpdesk. We will apply a charge onto your card that will be debited from your account at the end of the month. If you need to change your details after you have registered, please call our Customer Service Helpdesk. Please be advised that only the cardholder will be able to change their details with our Customer Service Representatives. There are a few things to remember when registering. You can only have one card registered in your name at any one time. If you are trying to register a new card please ensure that your old one has been cancelled with our Customer Service Representatives. Please ensure that you enter your Customer Number on the registration page. This can be found in your card pack or on the back of your MasterCard, in the bottom right hand corner. The activation key is found inside the card pack. It is six characters long and is a mixture of letters and numbers. This section is case sensitive, so please ensure to enter your activation key in block capitals. You may also have entered in an invalid form of ID. Please check your credentials and enter either your Passport Number or Driver's Licence* number and click submit. Your password does not respect the password policy. You password must be at least eight characters long and contain at least one capital letter and a number. * We can only accept your Driver's Licence if it is issued in Ireland, the UK or Sweden. All your personal information is kept completely secure and confidential and Swirl will never disclose your details to any other third parties. Swirl MasterCard’s prices are very competitive. We want to give our customers a faster, more convenient way of spending their money. €3.50 per month after 2 months of inactivity. This fee only applies to cards with a positive balance. The only additional charge you may occur is the registration fee of €3.95 which is only charged if you register with one of our customer service representatives by telephone. You can register for free online now by clicking on the Register a New Card link on our website. *Individual bank charges may apply - please check with your bank prior to making your transfer. When you buy a Swirl MasterCard you can load once up to €250 instantly. No registration, no ID or any other documents are required to purchase and load the card. To spend your funds once loaded you must register your card online. Once this has been completed your funds can be spent online, in-store or over the phone. Enjoy the freedom of paying for your purchases online and in-store. It is a much safer option than carrying around cash. Please note, at this stage the card cannot be used to withdraw funds from an ATM. To activate your card use at ATMs you will need to receive and confirm your verification code. Once your card has been registered and verified you can top up to €2,500 per 12 month period, you will be able to use these funds to shop online, over the phone and in-store and to withdraw cash from ATMs worldwide. The ATM limit on your card will be €1,000. This is the maximum you will be permitted to withdraw from your card in any 12 month period. All other funds loaded onto your card can be spent online or in-store. If you wish to increase the ATM limit on your card you can apply to have your limit increased to €7,500 as outlined below. To increase your SWIRL card limit to €7,500 simply log into your online account and click on the "Upgrade Limit" button. Complete the short questionnaire and submit it to us along with a picture of your Passport or Driving Licence. Please allow 5-8 working days for your request to be processed. We will call you to let you know once your limit has been increased. You will then be able to load and spend up to €7,500. Further limit increases to €15,000 and €25,000 are also available. Information on what's required can be found in the "Upgrade Limit" section of your online account. 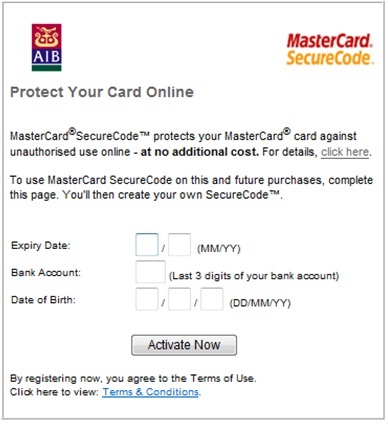 Please note this information is only available online once you have upgraded your limit to €7,500. 7. Who can get a Swirl MasterCard? Anyone over the age of 16 with a valid Passport or Driver's Licence* and permanently residing in Ireland can get a Swirl MasterCard. You don’t need a bank account and we do not require any information on your credit history. Swirl Card reserves the right to refuse a registration if the cardholder has submitted incomplete registration details. 1. What is Bank Transfer Top Up? Your can top up your SWIRL card by transferring funds directly from a bank account onto your card. It is the cheapest and most convenient way of topping up your card. This can be done by logging into your bank's online banking page. The bank account information you will need to set up your transfer can be found in your Swirl Card online account by clicking on "Bank Account Top Up". Please Note: It may take up to 48 hours for us to receive your online transfer. Once we receive your online transfer, the money will be available on your Swirl Card account before 12pm the following working day. 2. How do I top up my Swirl Mastercard via Bank Transfer? Go to your online banking site and follow the instructions to transfer money internationally. Please note that top ups will only be accepted from a bank account in the cardholder's name. Bank Name: Catella Bank S.A. Complete the transfer by following the rest of the steps on your online banking site. *Top up fee will be charged to your account & refunded back to you before 9am the following morning. Individual bank charges may apply - please check this with your bank prior to making your transfer. Only euro transfers will be accepted onto your card as SWIRL card are unable to process cross currency transfers. Please note that if you transfer money from a non euro bank account the transfer will be rejected and the funds returned to your account. SWIRL Card accept no liability for any fees or charges you may occur as a result of this returned payment. The amount you can top up by will depend on your "Remaining Load Limit". You can only top up by €2,500 in any 12 month period. If you want to load more than €2,500 in any 12 month period you will have to apply to increase your limit to €7,500. We would advise that you include the top up fee when transferring your funds. This fee will be debited from your card balance once the funds have been credited to your account. For example it will cost you €2.80 to top up between €10 and €350 so you would need to transfer €102.80 for a €100 top up. Individual bank charges may apply - please check this with your bank prior to making your transfer. For more detailed instructions on how to transfer funds from individual banks in Ireland, please click here. If you need any more information please contact your bank. 1. What is Debit Card Top Up? 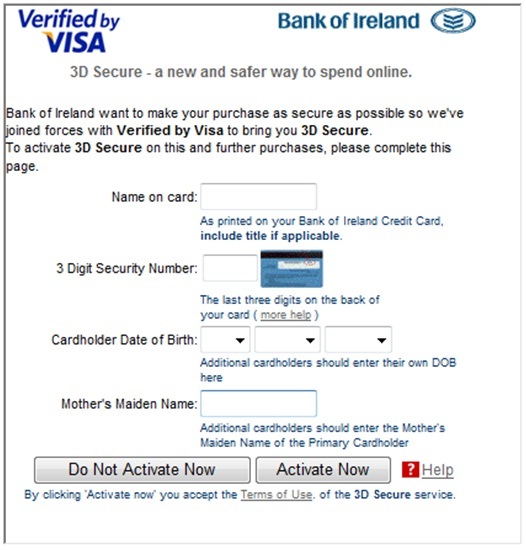 Please Note: Debit card top ups are secured using 3D Secure so you will be prompted to enter your 3D Secure password. For Visa Debit cards this is referred to as the "Verified by Visa" password. This was created by you with your bank. If you haven't already created a password you will be redirected to your bank's secure website to activate this feature. 2. How do I top up my Swirl MasterCard using my Visa Debit Card? Log into your online account and click on "Top Up via Debit Card". Enter the amount you wish to top up by. Limited time only Special Offer: 99c for every top up. 4. 3D Secure - How does it work? 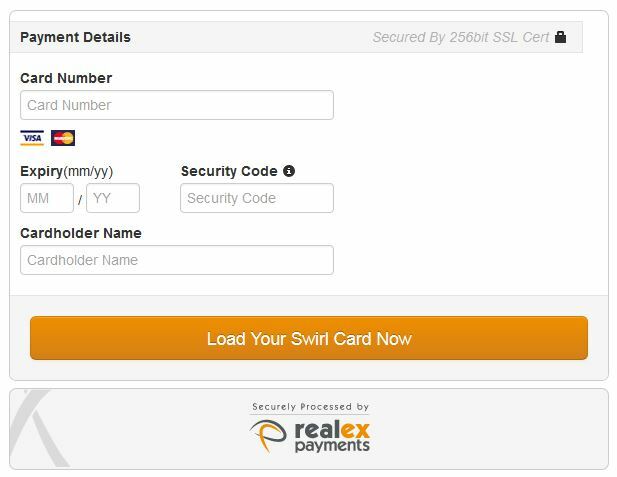 When you press the "Load your Swirl Card Now" button you will be prompted to enter your "3D Secure" password. This was created by you with your bank. If you have forgotten your password, simply click on the "Forgot your password" link to reset it. If you haven't purchased a product or service online using 3D Secure before you will be redirected to your issuing bank's secure website where you must verify some personal details and select a password. For more information on 3D Secure please contact your issuing bank. The Swirl MasterCard can be used at any ATM displaying the Mastercard logo*, 24 hours a day, at over 1 million ATMs worldwide. Simply insert your Mastercard into the ATM and follow the instructions. Remember you will need to enter your 4 digit PIN in order to complete the transaction. Please click on the link below to find your nearest ATM. How much can I withdraw at ATMs? The ATM limit on your card is €1,000. This is the maximum amount you are permitted to withdraw from your card in any 12 month period. The maximum you can withdraw in one transaction is €500. However, the daily limit on your card is €1,000 so you can complete multiple withdrawals in one day. These limits are also subject to the withdrawal limits of the local ATM. A fee of €1.50 will be charged for each withdrawal that you complete. Some ATMs may charge an additional fee for dispensing cash. We recommend that you avoid using fee charging ATMs. It is also important to note that the exchange rate may vary and that the currency withdrawn depends on the ATM used. Usually it will be the local currency of the ATM wherever the recipient is located at the time. Which ATMs can I use and how can I find them? Using Swirl Mastercard, funds can be withdrawn at any ATM worldwide where the Mastercard logo is displayed. Funds can be withdrawn 7 days a week. We recommend that all customers use an ATM that is attached to a bank rather than an ATM in shops and stores. To find your nearest ATM, please click on our Mastercard ATM locator below. *Please note that ATM withdrawal is only available to registered and verified cardholders. Your Swirl Mastercard can be used at over 30 million locations worldwide. Paying by card is a safer option than carrying around cash and a more secure way to shop. You can also keep track of your spending by checking your transaction history on your online account. Remember you will be required to enter your four digit pin code when purchasing items in-store. Card type: Please select Mastercard. 16 Digit MasterCard number: Found on the front of your Mastercard. Card expiry date: Found on the front of your Mastercard. Name: Name of the person the card is registered to. The maximum transaction you can put through on your Swirl card in one payment, and within any 24 hours, is €2,500. If you have the upgraded limit and wish to make a payment for an amount greater than €2,500, please contact Customer Service on 01 6877 985 and we will arrange to have your limits temporarily increased for you. Please be advised that some companies require the name on the order form to match that of the name of the registered card holder. If the company are unable to confirm the name and address of the cardholder, they may refuse to take payment from your card. Swirl Card does not accept any liability for any company that refuses to accept the card for this reason. 2. What codes and pins do I need to use the Swirl MasterCard? The Swirl MasterCard is a chip and pin card so you will need a four digit PIN code when making purchases in store. This code can be found in your card pack by peeling off the pin tab to reveal a four digit pin. You might need to hold the pin tab up to the light or against a white piece of paper to reveal the pin. Please note that this pin code cannot be changed. The majority of merchants throughout Europe are able to accept a Chip and PIN card. As many cards issued in the USA are Magstripe cards only (do not have a Chip), you may be asked to sign for your purchase without entering your PIN. Merchants may also require some form of photographic identification (passport/licence) before accepting your card. Customers should ensure that they have written their signature on the back of the MasterCard. You will also be able to use your pin code for ATM withdrawals. Insert the MasterCard into the ATM with the chip side entering first. Please ensure that the magnetic strip is facing down and the MasterCard and Swirl logos are facing upwards. *If you lose or forget your pin code please contact Customer Services on +353 (0) 1 687 7989 for advice on how to retrieve it. 3. Is there anything else to consider when using my Swirl MasterCard? Customers should note that a 15% tip provision applies to payments made using service terminals. These types of transactions usually take place at hotels and restaurants, the Taxi regulator, when booking your NCT and when booking tickets with Ticketmaster or other booking agents. This means that you must ensure that 15% of the original transaction amount is available to cover this provision. Please note that only the original transaction amount will be charged to your card. However, the transaction will not be authorised unless the 15% is available on your card in the first place. A pending transaction is a temporary charge held against the available funds on your account. It relates to an approval issued by the bank in response to an authorization request sent in by a merchant. The transaction is in a pending status until it has been cleared (or settled) by the company in question. Typically transactions are cleared within 1-2 working days. In all cases, pending transactions relate to purchases or withdrawals that have not been settled. What happens to a pending transaction? •Contact the merchant you had the transaction with. •Ask them to provide you with written confirmation (via fax or email) stating that the transaction was a pre-auth, cancelled or declined. 4. That the transaction has been cancelled/ used as a pre auth. Please forward this email to the Helpdesk on info@swirlcard.com or fax (045) 898798 with your loading card number in the subject line. Once we receive this information we will immediately forward it onto our issuing bank to have the transaction cancelled and the money returned to your account. This will usually be done within 24 hours of the email being sent. If you are unable to obtain written confirmation from the company SWIRL card can cancel the transaction manually after 5 working days if it is still pending on your account. For further information please contact our Customer Service Helpdesk on +353 (0) 1 687 7989. 4. How much is the exchange rate? We offer very competitive exchange rates to ensure that you can spend money worldwide without paying exorbitant fees or charges. The exchange rate is fixed by our issuing bank daily and is an indicative rate. When purchases are made, the exchange rate used will be the rate in effect on the day the transaction is settled. Please note that the amount charged on your card may vary from when the transaction is authorised to when it is settled. This would be due to fluctuations in the exchange rate from one day to the next. Please be advised that the currency conversion rate that you receive from online sources such as XE Currency Converter is only a mid market rate and does not include any of the administration fees charged by a bank. 5. How can I track my transactions? With Swirl you can access the past 18 months transactions from your online account. Simply log into your online account and click on “View recent transactions”. Your transactions will automatically be displayed on the screen. You can also view your transactions by logging into our Smartphone App. This can be downloaded for FREE from Google Play or iTunes store. If you have a query in relation to any transaction on your account or require a full transaction list please contact our Customer Support on 01 6877 985. 6. What happens if I forget the password for my online account? To reset the password for your SWIRL card account please click on the "Forgot Password" link on the login page. You will receive a link to reset your password to the email address you provided on registration. You will also receive this link via SMS. Once you have reset your password you will be able to login using your Customer Number and new password. If you experience problems resetting your password please contact our Helpdesk on 01 6877 985 and we will be able to reset the password for you. Please note: we can only reset the password for the account holder. SPECIAL OFFER : 99c for every top up for a limited time only! Swirl MasterCard's prices are very competitive. We want to give our customers a faster, more convenient way of spending their money. The purchase fee is applied at time of purchase so please remember to take this into account when topping up. Dormant account fee €3.50 per month after 2 months of inactivity. Only applies to cards with a positive balance. If your card has been lost or stolen, damaged or retained by an ATM, immediately call our Customer Helpline on +353 (0) 1 687 7985. Our customer service team will do their best to protect your money and advise the best procedure for each customer’s case. Alternatively you can access your online account 24/7 and suspend your card. Your card will be automatically blocked to secure your funds. To do this, log into your online account and select “Suspend Card” and click “Suspend”. Once the card is suspended you will need to call our Helpdesk to cancel the card. You will then be able to purchase a new card and re register. From there we can transfer your old balance to your new card. 2. How do I get a separate loading card for my account? If you need a separate loading card, please contact our Customer Service Helpdesk on +353 (0) 1 687 7985. Your loading card will arrive within 2-3 working days. 3. When will the Mastercard expire? The expiry date of your Mastercard can be found on the front of your Mastercard as the "valid through" date. 4. How do I replace my expired cards? You can purchase a new card pack from your local Payzone agent or purchase online for direct delivery. Please ensure you have cancelled the card with our Customer Service Helpdesk before you try to register a new card. 5. How do I withdraw my balance if my card has expired? You can purchase a new card pack from your local Payzone agent or purchase online for direct delivery. Once registered, we can then proceed to transfer your funds to your new Swirl Mastercard. 6. How many Swirl MasterCard’s can I have? You can only have one card registered to your name at any time. You can have up to three cards in a life time and up to 4 cards per household*. If you require more information please contact our Customer Service Helpdesk +353 (0) 1 687 7985. *The total loading limit per individual is €2,500 (€15,000 for certified customers), regardless of how many cards you have. You cannot exceed this limit by registering and upgrading multiple cards in your name. 7. What countries can I send money to? You can send money to every country where ATMs are available and where Mastercard is accepted*. 8. What happens if there are transactions on my account statement that I do not recognise? If you notice transactions on your account that have not been made by you please report them to our Customer Service Helpdesk where our representatives will investigate. You may be required to fill out a chargeback form including: date of transaction, customer number, dispute amount and currency, reason for your dispute. Upon receipt, our Issuing bank (Catella Bank) will start investigation. Your Swirl card will be only credited after successful clarification with the merchant. Note: A chargeback claim can only be opened within 8 weeks of the transaction taking place. The process take up to a maximum of 180 days to resolve and not all cases are resolved successfully. 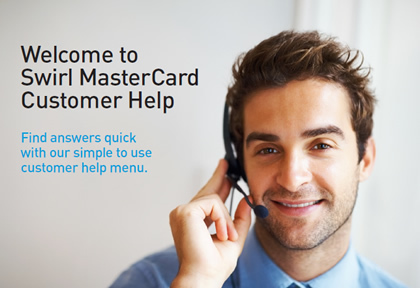 Swirl Mastercard provides a Customer Helpdesk Service where you can direct your questions and queries. The customer helpdesk can be contacted between 9am and 5:30pm Monday to Friday on +353 (0) 1 6877985. Our friendly and helpful team will require you to have your Customer Number ready and be able to confirm your details. We will never ask you for your PIN or MasterCard number. These details should never be revealed to anyone for security reasons. For non-urgent request and queries you can email our helpdesk on: info@swirlcard.com or use our Live Chat service where our Customer Service Representatives will be ready to help. 2. How can I close my account? +353 (0) 1 6877988 where our representatives will ask you to confirm your name and date of birth and the reason for closing your account. There is a €15 redemption fee for cashing out remaining funds on the account so we would advise you to spend your balance before cancelling your card. 3. How can I obtain remaining funds if I close my account? We recommend redeeming the remaining funds by using up all available funds in-store, online or through an ATM. Additional information is available in the Terms and Conditions in your welcome pack. There is a €15 redemption fee for cashing out remaining funds on the account into your bank account. Same price as a standard call.